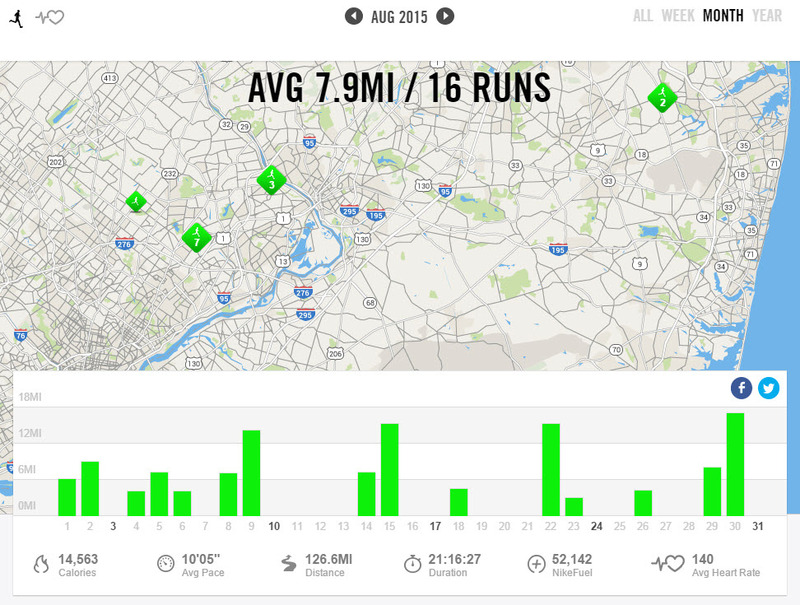 My Nike+ app shows that I ran 143 miles this month. You can see that there is a gap just before the marathon towards the end of the month. I took a few days off before the marathon as my wife was in California and I was looking after the boys and also to rest up my body before the race. I was tired. It’s been a busy year of running already and I was approaching my 3rd marathon of the year combined with a lot of business travel. Not much cross training. I think I had one session in the pool early on in the month. 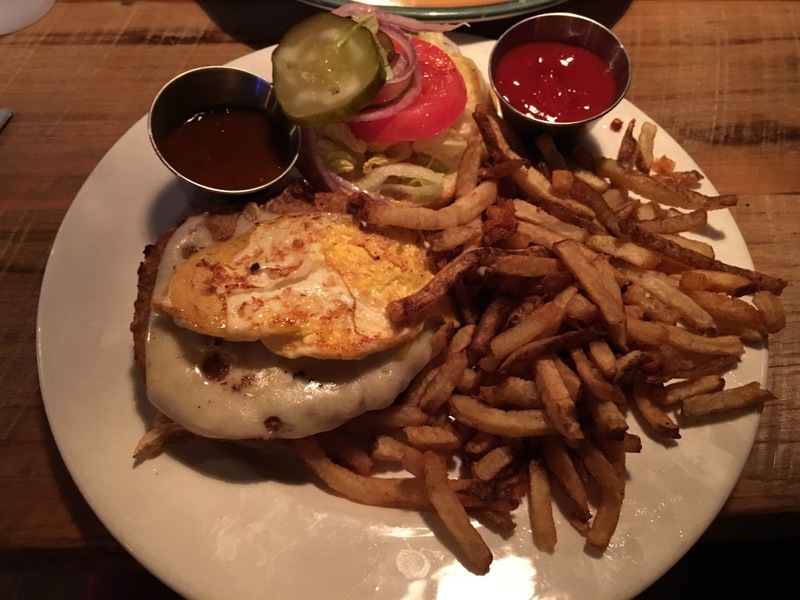 I had been traveling to Atlanta early in the month and then to Scottsdale. As soon as I got back home my wife had to head to California. 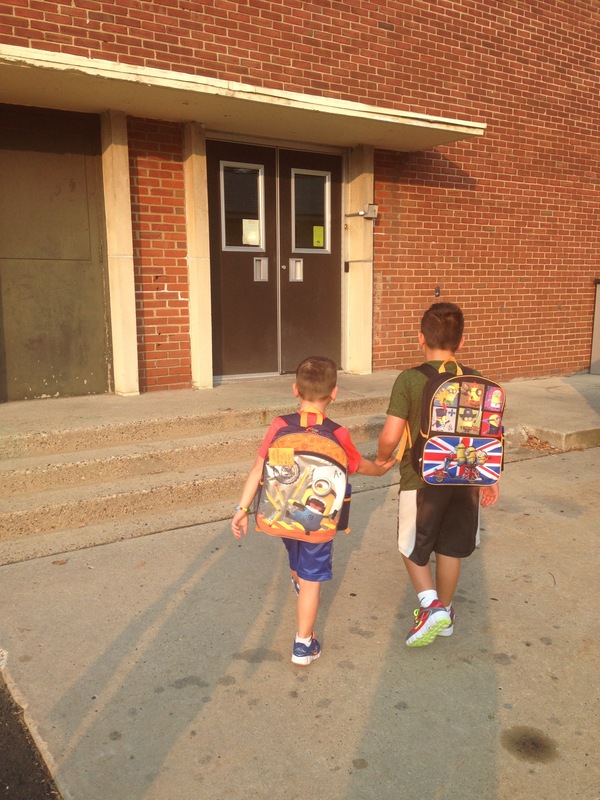 Tag team parenting as well as tapering for a marathon has never been so chaotic…but we survived. 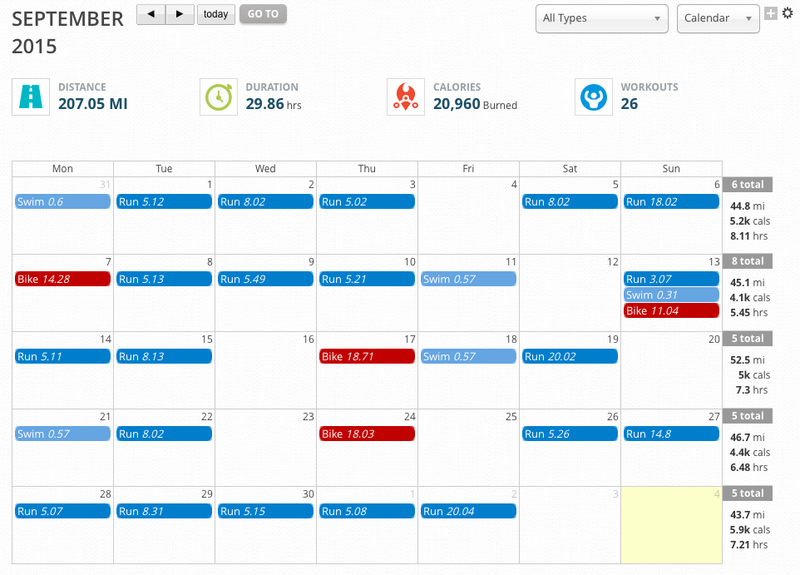 Early in the month I had my final long run planned before the marathon. It was supposed to be the first weekend in October. We my niece’s 3rd birthday party early Saturday and my wife was running the Princeton Half Marathon on the Sunday additionally they had predicted Hurricane Joaquin to make an appearance along the east coast. I had little choice but to get up early in my hotel and armed with a Powerade and a bag of Swedish Fish, knock out a 20 miler on the hotel treadmill before breakfast. Does that really say 2:06am? This wasn’t my favorite run. I was trying to break in my new shoes for the upcoming marathon. I had bought the newer model of my usual shoe online. Same size. I’ve been in the same shoe for 4 previous models. This model apparently runs a half size smaller. Yup, one heck of a blister. First time ever with this brand. Luckily I was able to go back to the running store and get this remedied before race day. 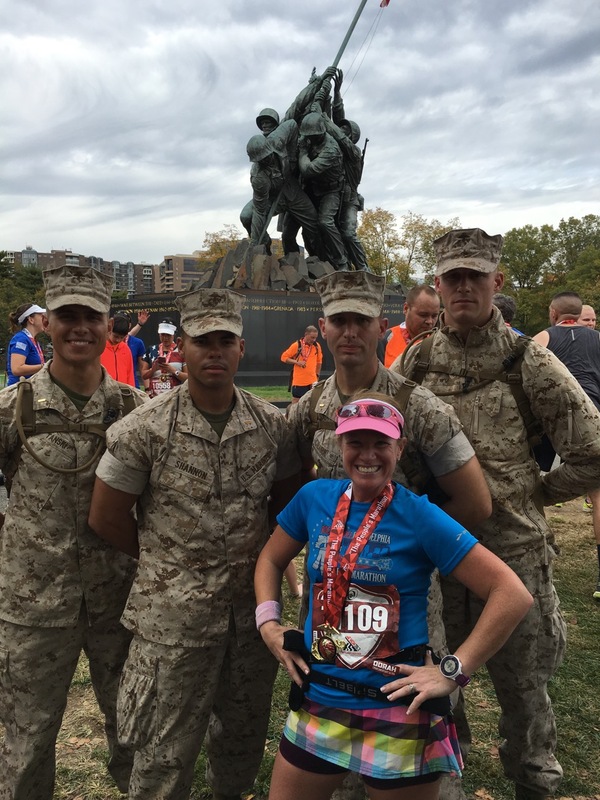 Once all the training was done we headed to Virginia to run the Marine Corps Marathon. It’s such a great event, regardless of our own personal experience this year. I highly would recommend you look toward this if you have any interest. 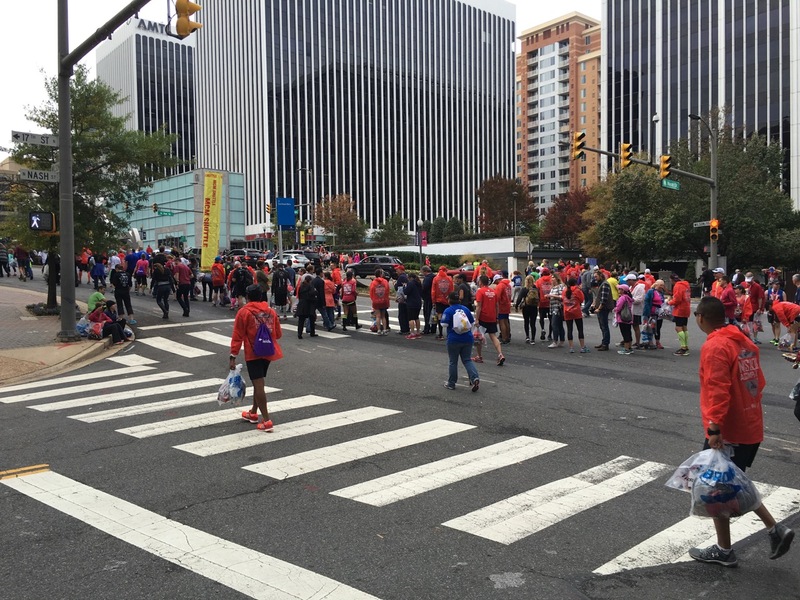 The week after the Marine Corps Marathon we ran the 2015 Rock ‘n’ Roll Philadelphia Half Marathon. It was on Halloween so it was a great excuse to run a race in costume. Although it wasn’t a runDisney event we still managed to run in a Disney theme, Alice in Wonderland. Not much of a surprise there. It was a great day weather wise and a great return to finding our pace which did not seem to come with us on our journey to Washington DC!! At the end of the month the early registration opened up for the 2016 New Jersey State Triathlon. If you’ve been following my ‘adventures’ in triathlon you will know that this was to be have been my first event. As it happened it was cancelled mid race and I never got to finish. The organizers offered those who competed and were unable to finish discount towards entry for 2016 which would work in the pre-registration period. I decided to enter again but this time for the Olympic distance in 2016. Fingers crossed. Lots of training to do over the winter to keep my fitness up on the bike and in the pool. November brings me to the end of my racing season. I have the Philadelphia Marathon coming up the week before Thanksgiving. A very special race for me. It was my first marathon back in 2011 and also the first marathon where I ran under 4 hours back in 2012. I ran again with my wife in 2013 but we missed last year due to being in Florida for Thanksgiving. Hopefully it will be another great race weekend this year. Looking forward to it. 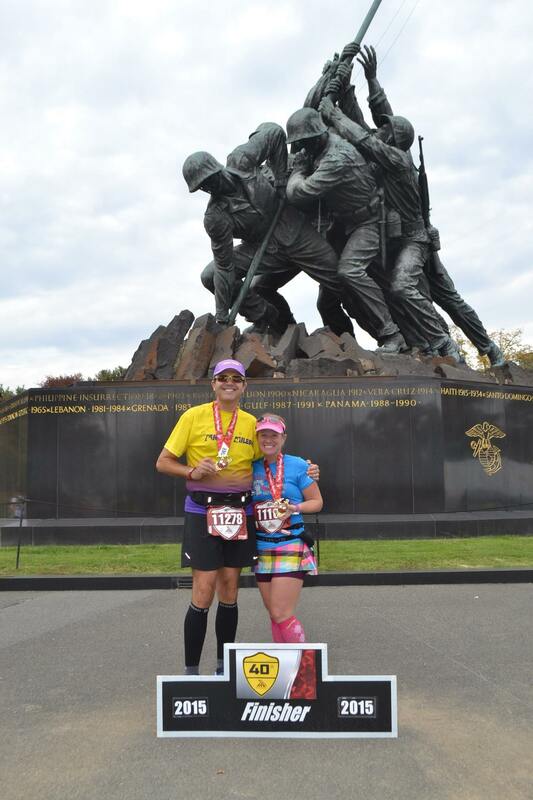 Back in March of this year my wife and I received confirmation that we had been accepted through the lottery for this years Marine Corps Marathon. This was to be the 40th Anniversary race and was sure to be a special weekend. My wife has a knack of choosing inaugural or anniversary races to run (her first and second marathons were the 20th Walt Disney World Marathon and the 20th Philadelphia Marathon back in 2013). Little did either of us know that leading up to the actual race weekend we would both be flying in and out-of-town pretty much until the week of the race so that meant lots of juggling schedules to get our training runs in. Fortunately we were able to get a couple of long runs in together as we approached October so that was a nice change as mostly we train separately due to our hectic lifestyles and looking after our two boys. Our hotel was one of the partner hotels which we booked through the race website and all things were taken care of before we arrived. We were staying in Tyson’s Corner which was about 45 minutes by Metro to the Expo in the city and just a little less to the Start/Finish area on Sunday. On Saturday morning we headed to the Expo. It was a little chilly and there was a bit of a breeze. We hoped that the weather the next day would be a little better considering we would be heading to the start line about 4 hours earlier than our start to the expo. The Metro that weekend was undergoing maintenance and some areas were single tracked. Genius planning I may add when you are expecting 30,000 runners and their entourages to descend on the event and telling them they must take the Metro. Finally we made it to the expo at the Walter E. Washington Convention Center in the center of DC (it was about a 10-15 minute walk from the White House). There were two other conventions going on at the same time so it was a bit crowded but the staff there were helpful and the signs were pretty clear as to where we should be going, although at the time we arrived it was starting to get pretty crowded. Once we got inside the expo hall it was pretty busy. It was around 10am by the time we actually went to pick up our bibs. Probably the busiest time of the day and we seemed to have been in the longest line to get our bibs. I guess ‘S’ is a popular start to surnames. The actual bib pick up process was very orderly (this was the Marines after all). 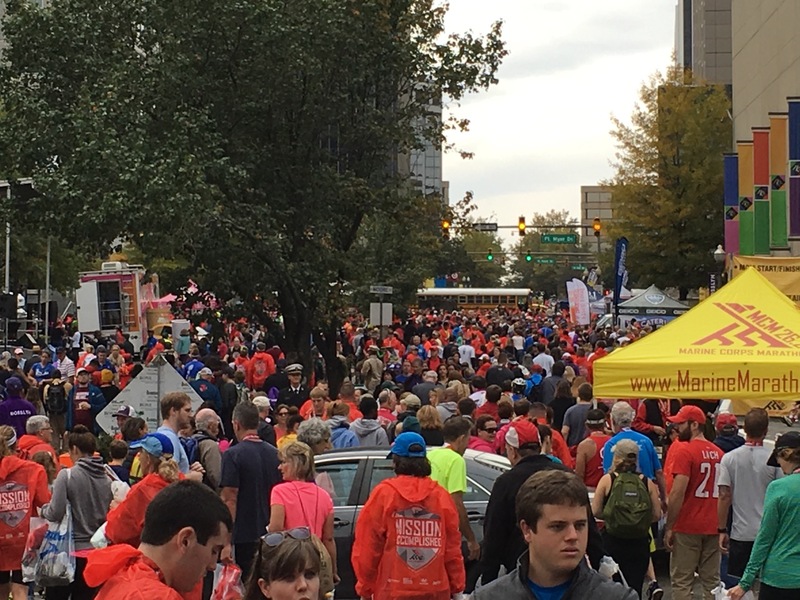 The Marathon was set up on the left side of the area and the 10K on the right. The t-shirts were at the far end and organized in male/female tables staffed by the volunteers. Speaking of volunteers, it was good to see Sid Busch who just recently completed his 200th marathon. 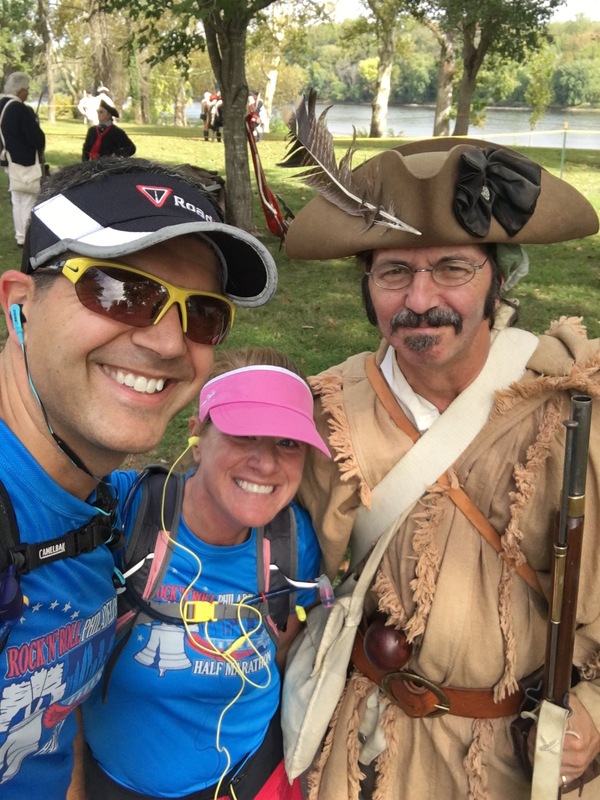 As well as running in honor of fallen heroes, Sid often volunteers at races. We saw him handing out bibs when we ran the Baltimore Marathon last year. How’s this for a check out line? I was in line so long I thought I would be riding the Haunted Mansion when I got to the end. The lines were pretty efficient and we finally reached a cash register. I don’t usually go crazy buying stuff at expos because I know it’s usually over priced and typically don’t need anything but this was a special race and we had a goal to get ourselves something as a reminder. Brooks were providing VIP Porta Potties on race day if you spent over $200. I wasn’t sure we would make it but somehow or other we spent $200.93…but they had run out of the VIP passes earlier in the morning. Oh no…we have to go to the bathrooms with the regular people LOL. Finally out of the merchandise areas and into the main expo itself. First stop, Bryer’s ice cream were giving out samples. I’m guessing that was a very popular booth that day. I was already planning how I was going to come around a second time. Look at that smile. It only takes ice cream before lunch. Other than the official merchandise we didn’t really pick up anything from the expo. There were not too many races displaying and it was a little crowded. We seemed to stop by every booth giving out free stuff for spinning a wheel so it’s pretty much like having both our boys with us. We did stop to look at this car but having seen the mileage this gets we decided to stick with something a little more fuel-efficient for our journey home. We stopped by the pace car on the way out and left our names along with everyone else and of course we had our obligatory bib photo before we left the hall. Remember kids, do not even think about doing this to Mommy’s and Daddy’s cars. As ready as you can be. With the expo over it was time to find a place to eat lunch. We had a few hours before our group dinner later and judging by where we were situated we could get some sightseeing in before dinner. We headed out of the expo and found a ‘Potbelly’s’ nearby was open and stopped in for lunch. We stood in line behind Jeff Galloway of all people. He’s so approachable and easy to talk to and always encouraging. He was running the next day and also appearing at the expo as an honoree of the race this year. We spent that afternoon sight-seeing. We were not far from the White House so that was our first stop. From there we walked the National Mall and around the Washington Monument making our way up to the Lincoln Memorial. I’ve been to DC many times but this was the first time I had actually been up to the Lincoln Memorial close up. Amazing. But the invitation never came. Maybe next time. After walking way too much for the day before a marathon we decided to hop in a cab to Georgetown to look around before we had to meet up with everyone for dinner in Crystal City. Some of my fellow Mickey Milers who live locally around the area had found a restaurant nearby to get together the night before the race. It was great to see so many. I think there were ultimately over 20 of us from near and far and a fun time was had by all. After a nice dinner with the group we headed over to the Metro to get back to our hotel. When we arrived on the platform I bumped into someone else I knew through the runDisney community and we chatted with him and his wife as we were waiting for the Metro. Given the current one track service it was helpful that he was there. He lives in the area and helped us get on the right train…which took a long time. I was a little worried about getting to the start line the next day. With that in mind my wife agreed that we should probably get the first train the next day. The Metro was due to start running at 5am on race day. As we left the Metro station and headed toward the hotel we met up with another runner who was coming back to the same hotel as us. We started talking about getting to the race on time and he mentioned that he didn’t want to get up too early for the Metro and would probably Uber his way there…we never did find out what happened to him, but more on that later. With the final preparations done we went to bed hoping to catch a few hours before we had to head out to the Metro for our 5am(!) train. So 3 something in the morning arrived and it was time to get up. 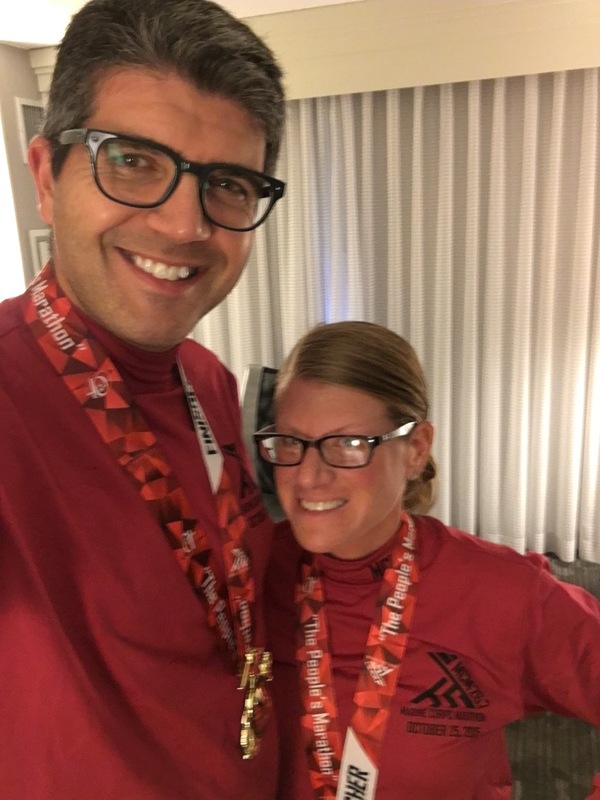 Both of us got ready and headed downstairs to the lobby where we were able to sit by the fireplace for a few minutes before following the other runners to the Metro station just before 5am. When we got on the platform we met up with another Mickey Miler, Brad, who was staying at a nearby hotel. Brad had run the race before and was a good source of advice and a great person to talk to as we travelled to the race start (which included a change of trains). We were very glad we took the first train because apparently there was a real SNAFU that morning with the Metro. It seems that in addition to the single track service, that one of the trains hit an animal on the track which caused further delays. Getting to the start is not any easy thing for this marathon. The nearest open Metro station is Pentagon which is a good 10 minute walk from the starting area. Nevertheless we got there early enough and were able to get through security (metal detectors and bag check) fairly easy. At this point we said good luck to Brad and we went about our own way to get ready for the race. We were surprised that it didn’t seem that busy. We wouldn’t find out why until later in the day but needless to say we were able to get our gear ready, there were no lines for the bathrooms and we were able to find ourselves a spot to sit down in a tent. Sitting under the tent and keeping ourselves warm. Luckily we were sitting in the tent as very shortly thereafter it began to rain. I knew that it was in the original forecast but we thought it would have passed before the start of the race. This caused additional problems at the start area. It seems that in addition to the single track trains and the accident on one side of the tracks, the rain was now causing problems with the metal detectors at the security lines. Apparently half of them ceased working due to the conditions. We followed everyone to the corrals and when we go there we noticed that some of the people we were expecting to see we not there. This was due to the security line problems. We took our group picture and went over to the corrals. 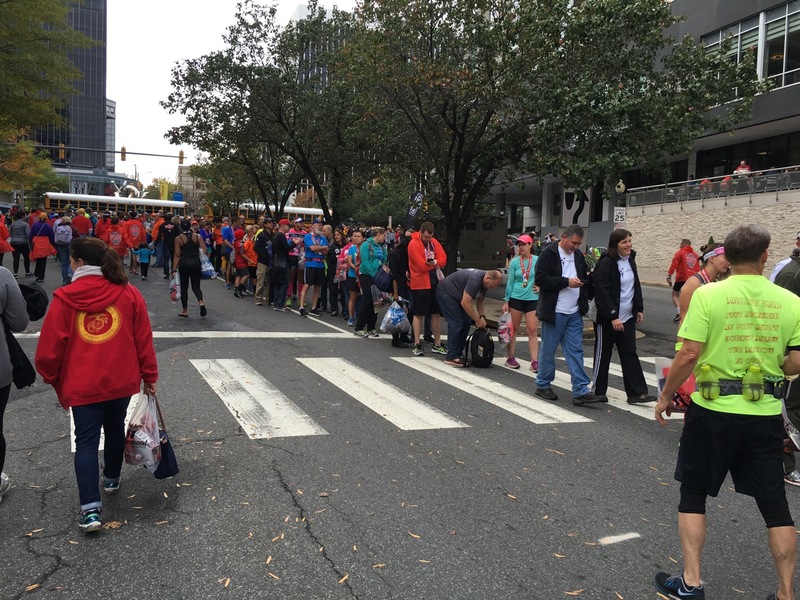 Unlike many other races where there are separately timed corral wave starts, this marathon uses the honor system where runners line up at their anticipated pace and finish time. There are no wave starts meaning everyone just goes off at the same time. We figured this would be a safe pace for us to run. Once inside the corral we were in for a real treat. This marathon is known for its great starting experience. Firstly the national anthem was sung and then over head a performing parachute team jumped down to the start line trailing some very large American flags. Shortly thereafter, helicopters flew over the corrals. It was an incredible few minutes. The parachute performers landing at the front of the corrals. The helicopters then roared over head. Just before we were about to start (they fire a Howitzer) our friends joined us. They had missed the group photo due to the security lines but made it just at the start. So, no waves and everyone going at the same time. Sounds like a good idea if everyone is lined up in their correct pace areas. The faster runners at the front start to open up a lead and the mid and back of the pack gently ease behind them in a natural stretch of the field. The problem today was that with so many people stuck in security they had to keep the start open an extra 45 minutes to get everyone in. That meant that many of the runners were not lined up in their correct corral. Faster runners who hadn’t made the start needed to get through slower runners to be able to run their race. Also, wheelchair and hand cycle athletes always start ahead of the runners. Late arrivals started behind the runners and at the pace they go, this meant that the crowd would have to part to let them through. Sounds like a bit of an unfortunate mess. Added to this, the first 8-10 miles of the course is fairly narrow (and there is a big hill that will slow you down at mile 2). With the recent rain, people already had wet shoes and puddle jumping became part of the challenge of the day in addition to the jostling of the other runners. With wet leaves on the ground we also saw people take a tumble early on. This was going to make it into one tough day for many people. Finally, we saw the start line. It actually took us 13 minutes to cross the start line. Once we were actually out and running we spent most of the time focusing on footing (puddles) and positioning (people). It’s not very often that at mile 8 of a marathon I’m feeling like this is taking too long. It was pretty draining staying focused. It’s a shame really because during the first few miles I didn’t really get to see or appreciate much of the course. It was still lightly raining at this point. I think by the time we got to Georgetown it was the heaviest it would be during the race but it was still early on and we had many more miles to go. Around mile 5 to 8 there is an out and back section which is narrow on both sides. At this point we had to make space for two hand cyclists and a pace group which made it very tight. Thankfully the woody surroundings were enough to lift our spirits. It was very quiet (surprisingly) maybe because people we just focused on moving forward at this time. Maybe because the crowds both before and after this section were so loud and supportive it just seemed much quieter. Either way it was calming. I was amazed thought at one point when a runner ahead of me cut the course and jumped from mile 5.5 to beyond mile 8. I know it shouldn’t bother me but it does. People train hard for this and to cut 3 miles and then claim a marathon medal is a little mean spirited. We did see someone take a pretty bad tumble at mile 8 just behind us and my wife immediately turned around thinking it was me. That says a bit about the crowds. Normally my wife and I run alongside each other. It wasn’t possible here. Once we left the wooded area we ‘stormed the District’ as we headed into DC proper. We crossed over and ran behind the Jefferson Memorial alongside the Potomac River. They were handing out orange slices to the runners and these were amazing to have right there and then. So now we are in the District of Columbia. Firstly, wow…you are so close to Reagan National Airport you think planes are going to land on you (this close to the Capitol and the White House!!!) and you could see the runway as we ran along the river. Second, you are now in a National Park which essentially means real bathrooms!!!! As we crossed over into the District we were greeted by a band of Marines playing us on. It was great. There were so many people out and cheering us on. As we rounded the Jefferson Memorial (which itself is a pretty narrow pathway) through to Mile 12 we approached the Blue Mile. The Blue Mile section of the course is where fallen service members are commemorated by pictures along the roadway decorated with American flags. Incredibly moving seeing the images of these very young men and women and their families. Heartbreaking. As you complete the Blue Mile volunteers holding flags were cheering us on. We should have been cheering them on. Once out from the Blue Mile we round the park and headed into the National Mall area. As we excited the park we noticed there were signs every few yards that must have been set up by a local running club. Not only were they calling out individual team mates (and it seemed to be a big club) they were funny and kept my mind of the fact that as tired as we were feeling we hadn’t yet reached the half marathon distance!!! Once we hit the National Mall area the crowds were deep and loud. Great motivation and I think we actually picked up the pace for a little while. This stretch of the course was flat and a good excuse to do a little sightseeing. Here was a great sign that we saw as we toured the Capital. Once we rounded the Capitol Building and were moving around the Smithsonian Institute we saw our fellow Mickey Miler Dave who had travelled down from New York to cheer us on during the race and also brought us much welcomed treats. He had a cooler with water, Coke, Swedish Fish, pretzels and oranges. What a star. I gave him my biggest sweatiest hug which I’m sure he appreciated at much as the orange slices we took from him :-). So grateful to Dave for coming to cheer us on and provide some refreshments for all of us. Our next challenge would be the infamous ‘Beat the Bridge’. This is the cut off point for the Marathon. If you don’t make it to the bridge by 1pm you are not allowed to complete the marathon and they open the bridge back up to traffic. As we rounded the Mall I started feeling a really sharp pain in my right foot. Let’s just say it hurt. Bad. I’d never had this before during a race or even a long training run. It was very weird. Also around the same time my wife started having a little trouble with her hip. We were a bit of a mess and we were only at mile 18. Eventually though we made it to the bridge at mile 20. Not the ‘pick me up’ I thought she meant. So at mile 20 you cross the bridge. It is one heck of a long bridge. Although we technically ‘Beat the Bridge’, by the time we got to the other side I think it had beaten us. At this point both of us had to stop every few hundred yards to walk. I couldn’t figure out my foot pain but I did learn that I can indeed swear like a sailor (or a Marine) during that bridge crossing. Miles 22 to 24 was an out and back around Crystal City. We again saw Brad who was just ahead of us and a few other Mickey Milers who were running roughly the same pace. At the turnaround there was a fire engine which was providing a light mist to cool runners as the temperatures were now rising. Once we left Crystal City it was back to Arlington and the last two or so miles past the Pentagon through the starting line and towards the finish line at Arlington National Cemetery. At this point the pain in my foot was bad to the point that I was probably using some very bad words and not doing so very quietly. Shari was also very uncomfortable at this stage. We knew this was our slowest marathon to date (non-Disney) and we were just looking forward to finishing up and getting off our feet. As we hit mile 26 you see the finish line. It is one heck of a 0.2 mile straight uphill. This is where we would ‘Take the Iwo’, a reference to the Iwo Jima Memorial at the top of the hill. As we ran up the hill there were great crowds on either side and also the Marines were out there in full force cheering us (I think yelling at us is more an appropriate description) to make it up the hill. The ground had ‘Oorah’ written in big letters. I looked at Shari and shouted “Oorah” to which she shouted back “Don’t ‘Oorah’ me! !” with eyes that scared the living daylights out of me at the time. I guess she was hurting badly too. Finally we made it across the finish line. 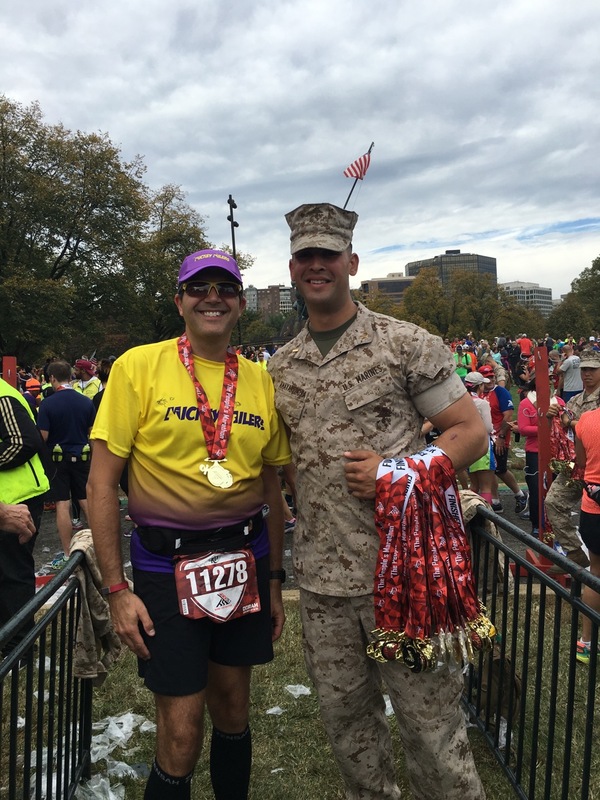 The Marines were on hand at the finish line and as we made it through the finishers chute we both agreed that this was the hardest race we had done. We were presented with our medals by a Marine who saluted us first and then placed the medal around our necks. We thanked him for his service. I mean really, we just ran a race but he and all the other Marines who were helping out at the race do far braver and more challenging things than run a road race. These guys are true heroes. Happy to have finished and happy to have a Marine photo again. 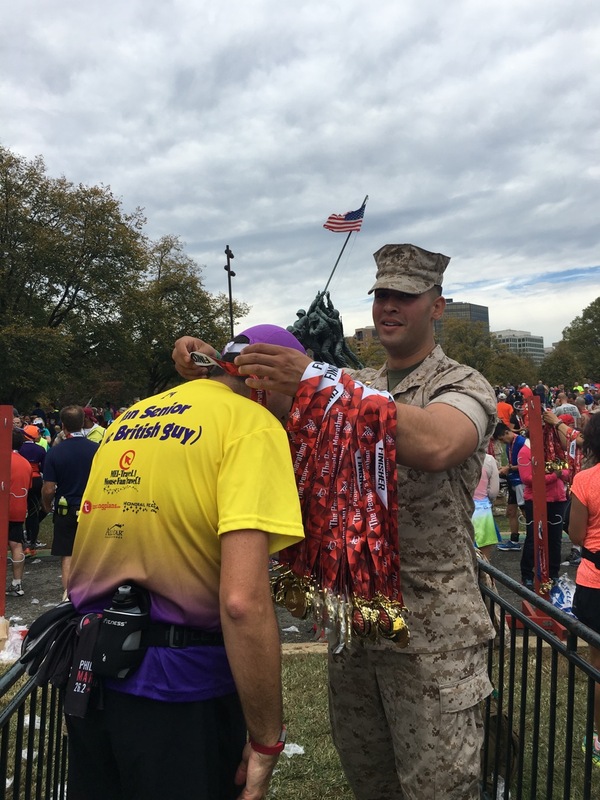 It was a great treat at the finish line to be presented the medal by a Marine. 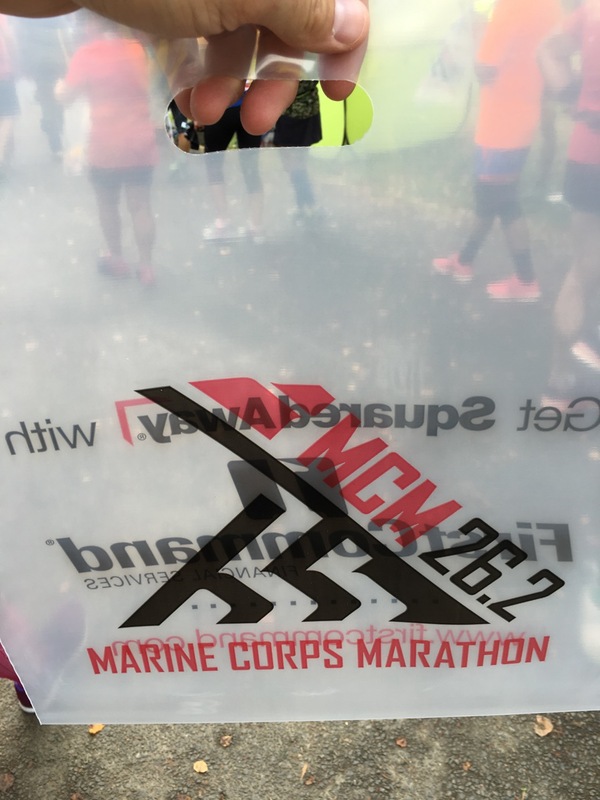 As it was the 40th anniversary Marine Corps Marathon the medal had a little extra special look to it. Beautiful piece. We sure look happy to have finished. As we walked beyond the finish line and the medals we were in front of the Iwo Jima Memorial, the memorial for the Marines. What a very special place to have as a finish line. Just incredible. Oh…one final Marine photo opportunity. 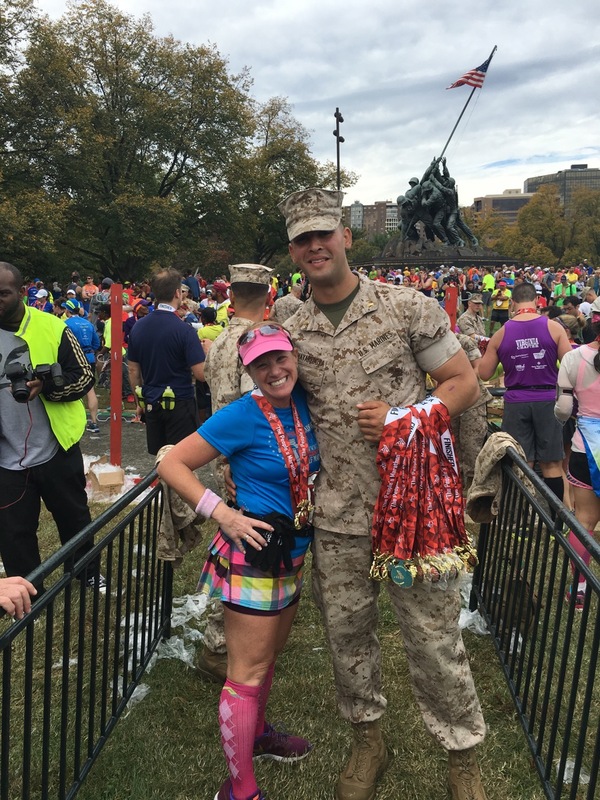 She made the Marine on the left smile….short jokes are funny!!! As we exited to the finish line area to the family reunion and finish festival areas it was very crowded. It was very organized at the finish with the Marines handing out a water bottles, a plastic bag to carry post race items (nice touch…are you listening runDisney, Rock ‘n’ Roll Philly?) 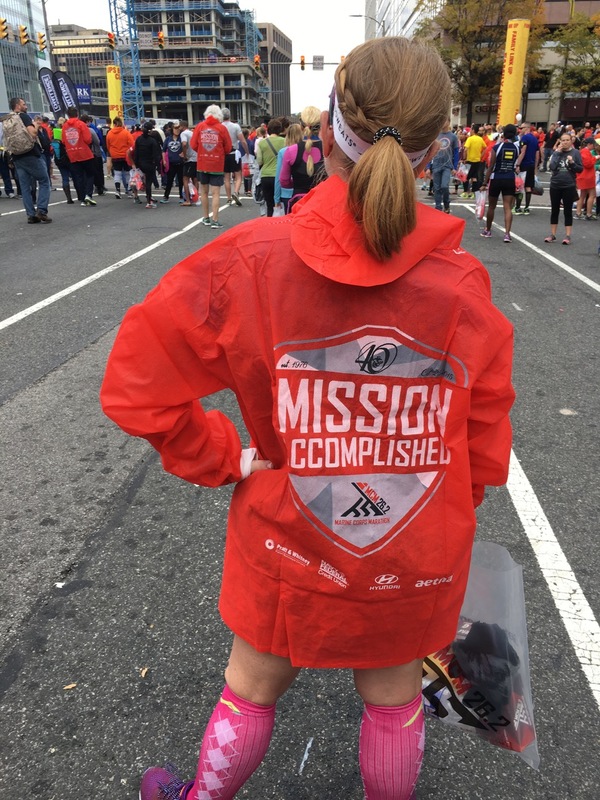 and also the famous ‘Finisher Jackets’ in lieu of a mylar blanket. There were also bananas and pre-packaged food boxes. Nice touch. One that other races should consider. That’s a fancy little jacket to keep you warm post race. “Mission Accomplished” is right. Beyond the food and water was the finish line festival…which is where the chaos began. I’m sure it’s the same every year (as per what I have read) but it’s really hard to get out of the area. 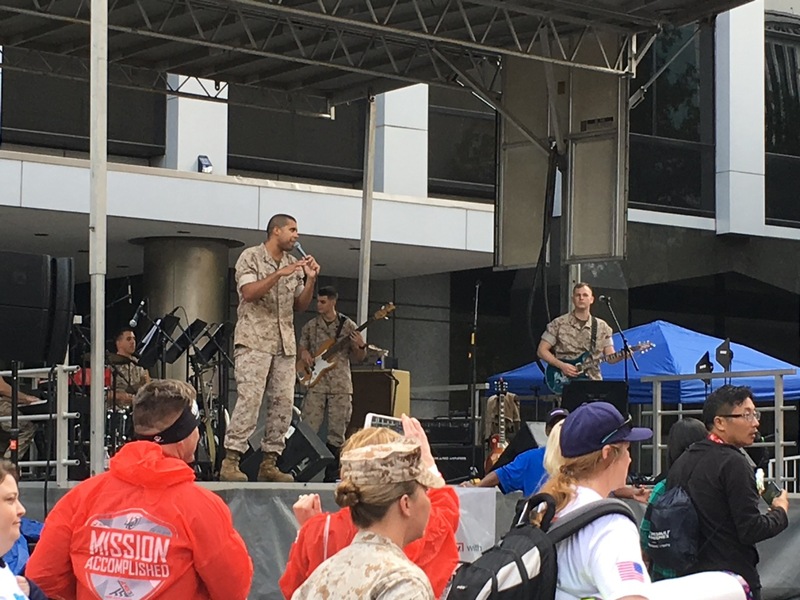 The finish festival had some merchandise and there was an amazing band of Marines rocking out on the stage. They sounded awesome. We looked around a bit, grabbed some free samples of watermelon (which was amazing) and made our way up towards the Metro station….BIG MISTAKE!!! The line for the Metro (remember, running only on one track) was ridiculous. It stretched out of the station for 3 blocks. I can only imagine how crowded it would have been on the platform and in the station itself. Crazy. Still the line for the Metro!!! We decided to not take the Metro and to move our way out of the finish area where we might have the chance of grabbing a taxi. Again, BIG MISTAKE!!! The roads were still closed as the line for the shuttle buses was almost as long as the Metro. The line of regular traffic meant that getting a cab was useless as we would have just sat there with the clock ticking. It had been a long race for us and we were behind schedule so we decided to wait on the return journey and find a place to eat. There were places close by within a 10 minute walk. As we were wandering around we met a local and asked where we should go. 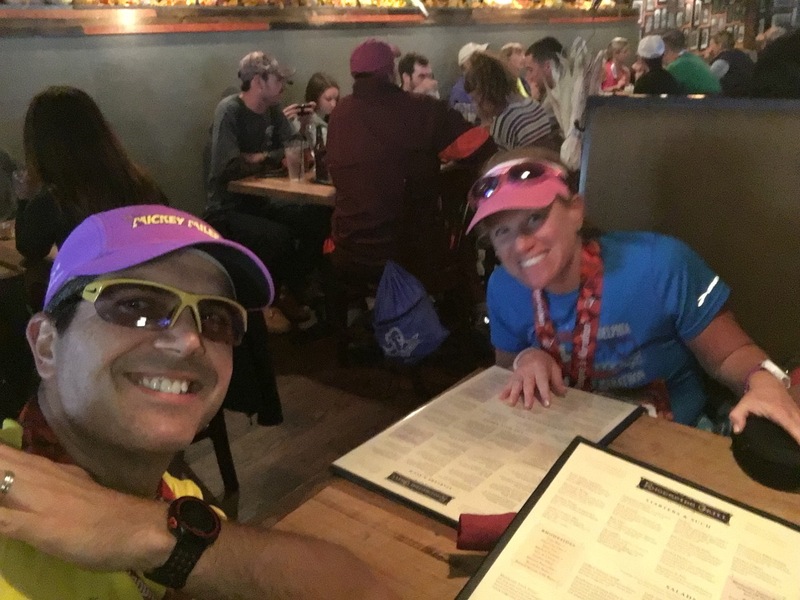 She pointed in a general direction and we saw a restaurant with a bunch of runners sitting eating and drinking so we went in and took a table inside. I can only imagine what the staff were thinking. All these stinky runners in one room with no ventilation….charming. Once we sat down I took of my shoes and bingo….found out what was causing me pain. When I first started running I had a very nervous habit before races of tying and re-tying my shoes to feel a good fit. In fact I stopped to tie and re-tie my laces twice in my first marathon. Finally, so as not to cause a major accident from runners behind me, I started to use ‘Lock Laces‘ in all my running shoes. Never had to tie laces again and with the addition of being elastic they could stretch out a little as my feet swelled over the course of a marathon. A couple of weeks before the marathon I started to break in my new shoes. They were the newer model of the shoe that I normally wear, the Brooks Adrenaline GTS. Little did I know that the new model ran a half size shorter. I ended up with a rather nasty blister for the first time ever following a 20 mile training run. I quickly went back to my local running store and was able to up-size them to a new pair with no problem…except I hadn’t fully broken them in and hadn’t really put the Lock Laces in at the right tension. Over time I’d started putting in the laces a little tighter and tighter until there was little, if any, give left in the elastic. It appears that on this occasion I had simply set the laces up too tight. That was why around mile 16 I started to feel pain. As much as I adjusted the laces from there on in it was too late. There wasn’t enough give to ease the pressure on my foot. Once I took the shoe off I saw what I had done. Let’s face it, it was a simple and stupid fix but caused 10 miles of real discomfort. Incidentally, I adjusted the laces when I got home and two days later ran a pretty fast 5K split with no pain whatsoever. I felt pretty dumb. Anyway, with the shoes off we were able to comfortably eat our way back to happiness at this restaurant. This included a nice apple cobbler dessert with ice cream. Yum! Seated and shoeless. Look how I am smiling now. 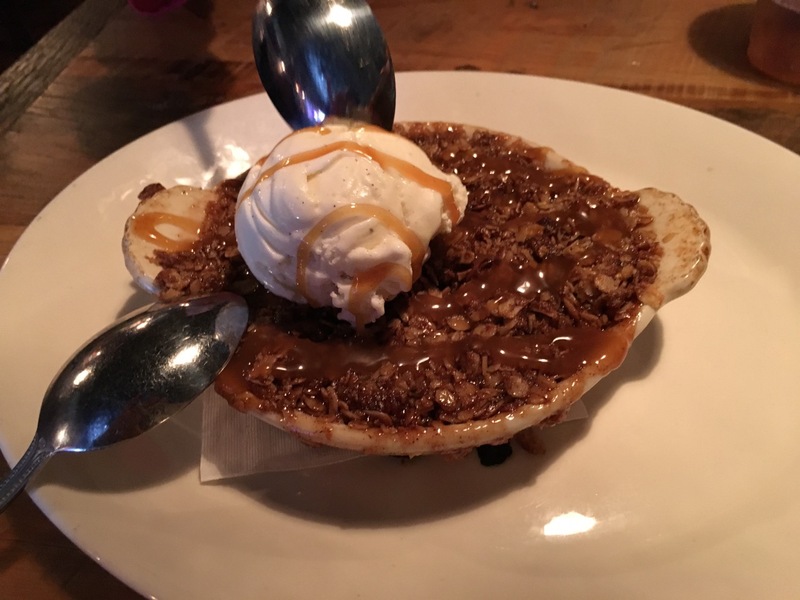 Earned my medal…earned my dessert. Note there are two spoons despite what my wife will tell you. After lunch and the time off our feet we headed out. On the way we asked the hostess where the nearest Metro was. It was right up the street and there were no lines. We made a beeline for the Metro station and got on a train within a minute of arriving on the platform and headed back to our hotel. Having moved out the area and taking a break for lunch saved us plenty of time off our feet and waiting for a train. GOOD IDEA!!! Once back to the hotel we had little time to hang about as we had to be on the road and back home before it was too late. We set off around 5pm and due to a traffic accident ahead of us didn’t make it home until nearly 10pm. Ugh. But considering the long day I will tell you I slept very well that night!!! All cleaned up and ready for our drive home. Talking with friends in the couple of days after the race they all agreed that it was a pretty tough race. I don’t think its the course itself which was challenging, but the whole mess up at the beginning of the race with people starting late and then fast runners pushing through what was a crowded course (which it probably wouldn’t have been on a normal year) made it exhausting just to keep going. It was fun though. Glad I got to see all my fellow Mickey Milers and got to experience the great parts of this race first hand. I would highly recommend that you give it a try. 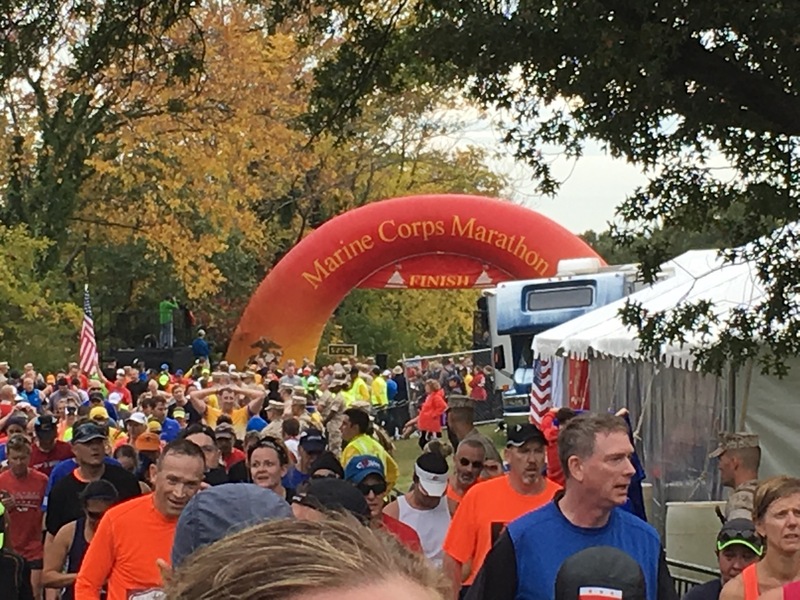 In the days post the race, the Marine Corps Marathon Race Director acknowledged that there had been issues at the start and that they ended up extending the time they kept the bridge open for about 30 minutes later than originally planned to accommodate the runners who had been affected. Then you realize you were not just making this stuff up on your head. I look back and say that it was tough but we got it done. 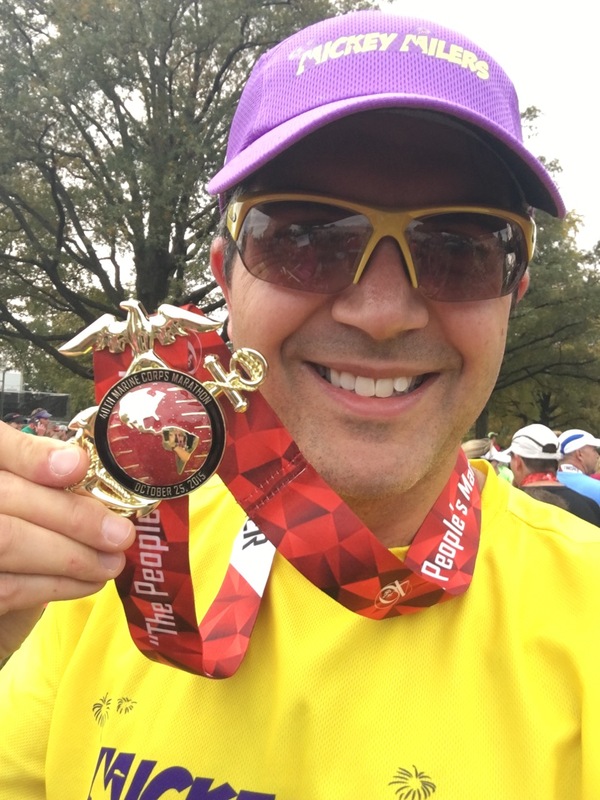 You cannot run a race like this and see wounded warriors, Marines running in full gear packs, people running with American flags held high and experiencing the Blue Mile without it having a very emotional and motivating effect on your experience. Well done to everyone taking part in this event whether they be runners, volunteers or spectators. It was a great day to be a runner. 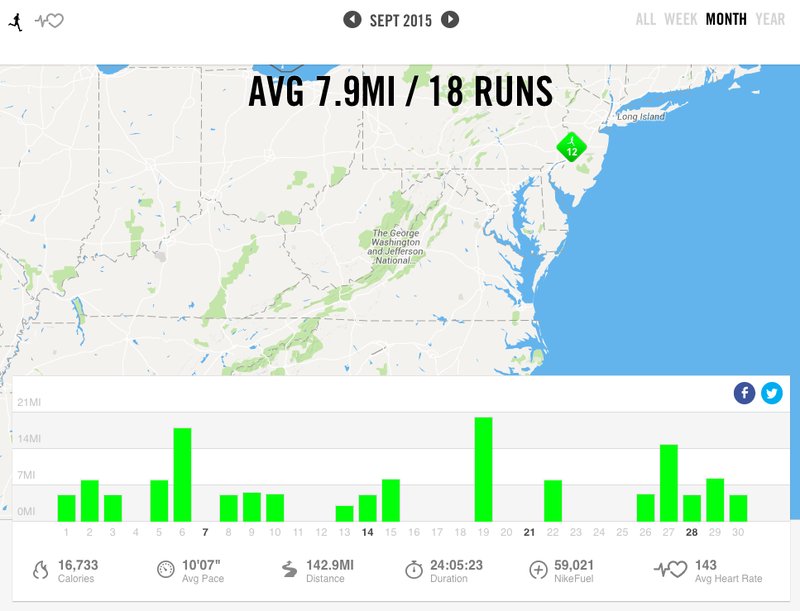 126 miles this month logged in the Nike app. 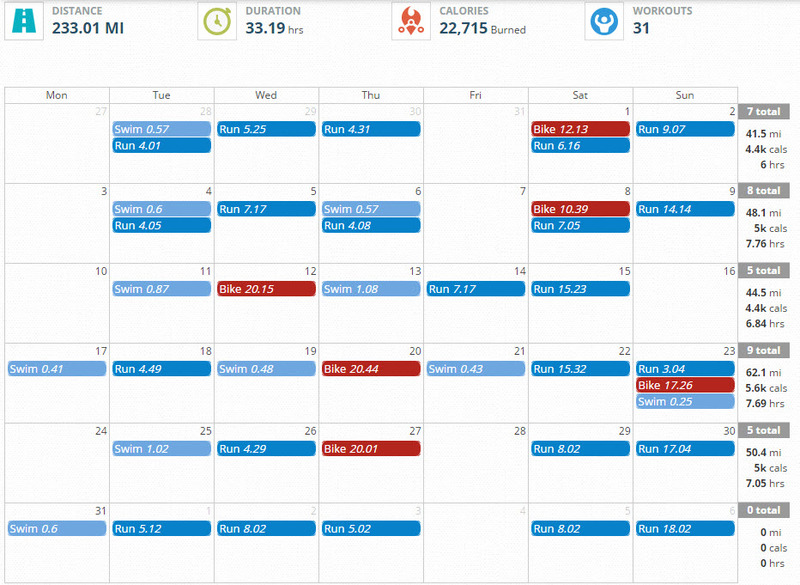 My running has increased from prior months as I am now ramping up the training to the Marine Corps Marathon this October. I had the pleasure of running 15 miles with my wife one weekend when our boys were visiting the Baseball Hall of Fame with their grandparents. They had fun and so did we. Not a bad deal. A highlight for me this month was completing my first triathlon at the Medford Lakes Colony Sprint Triathlon. It was lots of fun and the weather cooperated this time. I am actually having fun doing things other than just running and it feels great. Lots to look forward to in September, October and November. I am all signed up for the Hightstown Triathlon in mid-September. 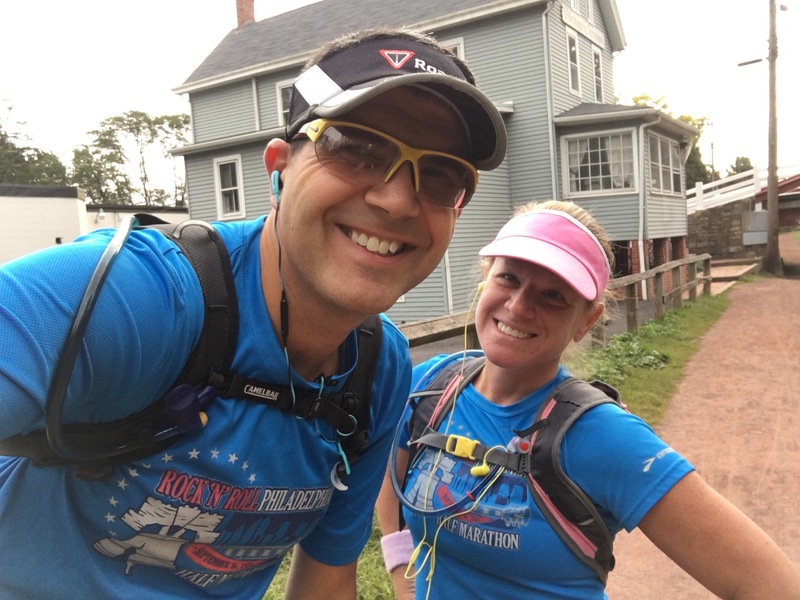 In October my wife and I are running in both the Marine Corps Marathon and on Halloween the Philadelphia Rock and Roll Half Marathon. 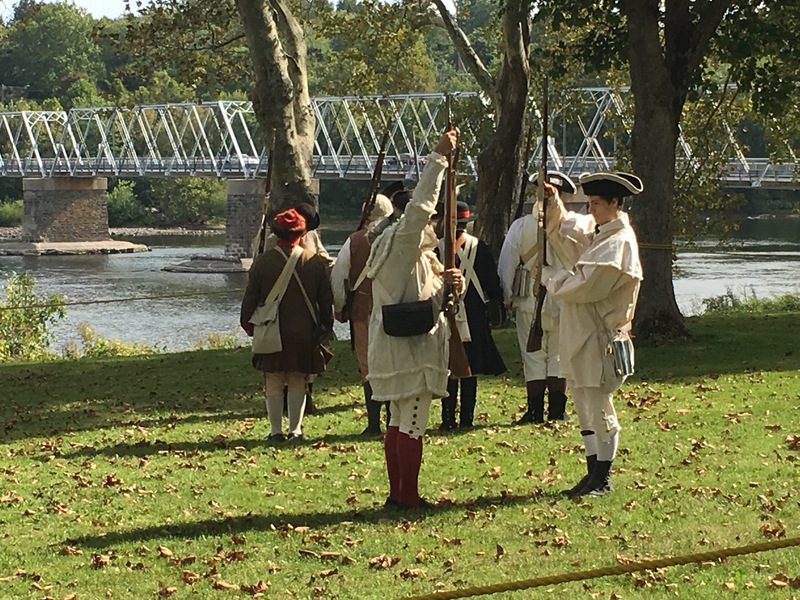 Finally in November I am running my 4th Philadelphia Marathon and my wife and I are running our annual Bucks County Road Runners Thanksgiving 5 miler. Lots of training to do between now and then. 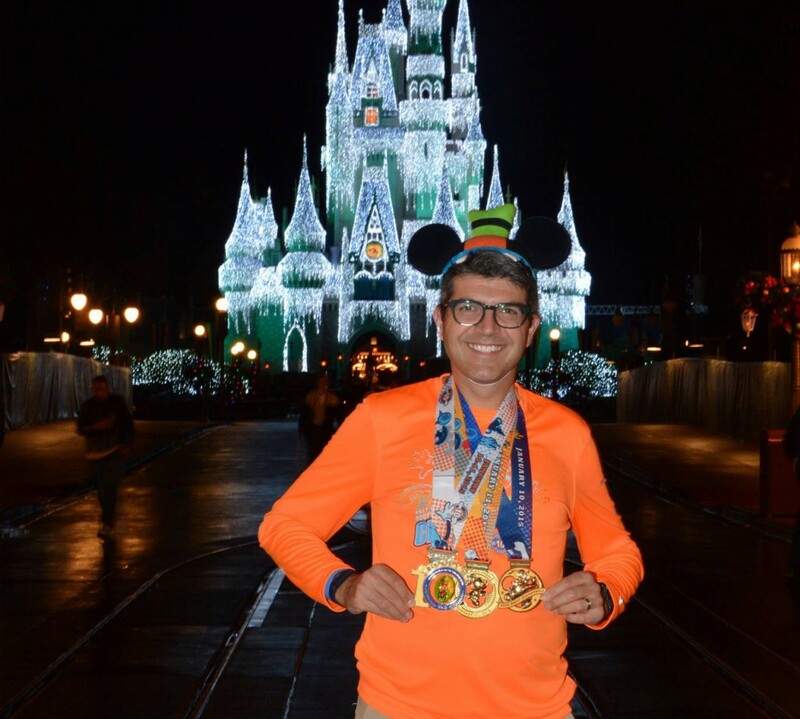 This is the first year since 2011 that I haven’t a runDisney event on my calendar for January so I have a little break from training this December. 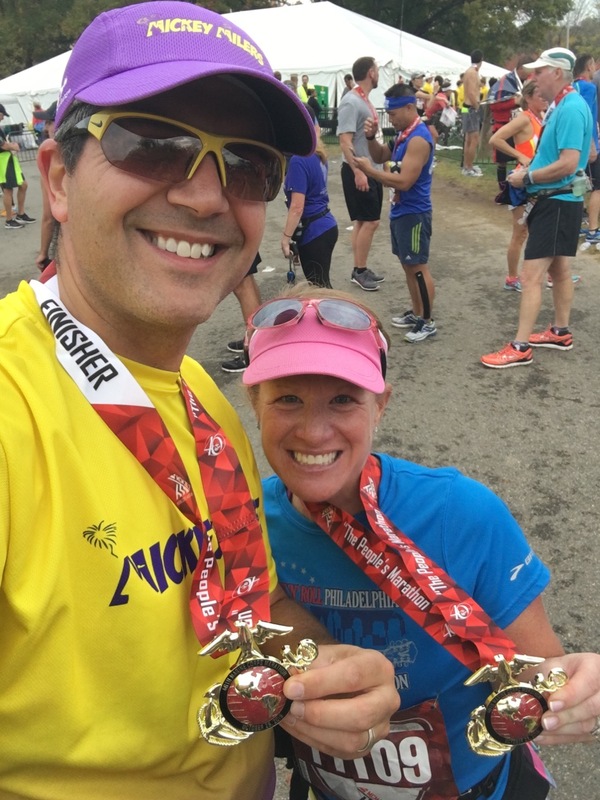 My wife and I did sign up for a spring marathon so we will be training again through the winter months. We signed up for the New Jersey Marathon on May 1st. This will be my 3rd New Jersey Marathon (and home of my marathon PR) and my wife’s first. It’s a nice fairly local race so it’ll be fun for us. The plan is that we look for a spring and a fall marathon to run together each year. I like the sound of that.